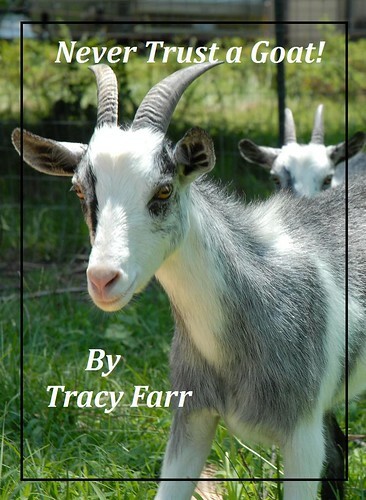 The Farr Place: "Never Trust a Goat"
Monday was an auspicious day for my e-book "Never Trust a Goat." No, it wasn't picked up by a New York publisher; no, it's not going to be made into a movie; no, Mattel isn't going to make goat action figures based on it. On Monday, somebody downloaded "Never Trust a Goat", bringing my total to a whopping 200 downloads. I know, big deal. But it IS a big deal for me because that means I successfully conned 200 people to download the e-book -- or maybe just one person downloaded it 200 times (thanks Mom). Holy Cow. That means absolutely nothing. Okay, for my e-book to mean something -- even if it's just a little something -- I think I've earned the right to charge for it. Not much. Just 99 cents. And then if 200 more people decide to download (or Mom 200 times), then maybe I can buy my goats some better goat feed. So, how's about it? Want to spend a buck for "Never Trust a Goat'? It sure would make my goats happy.